1If frozen, leave the prawns in a sink half filled with cold tap water until beginning to thaw. Remove the heads. Cut through the hard shell, along the backs, with a pair of kitchen scissors and then slice each prawn almost completely through the flesh, with a sharp knife, to butterfly them open. Remove the black vein and rinse in clean water. 2Skewer the prawns on wooden kebab sticks to keep them flat, as illustrated. Season each prawn on both sides with Chilli & Garlic Seasoning and brush generously with olive oil. Leave covered in the fridge with an ice brick on top until ready to cook. 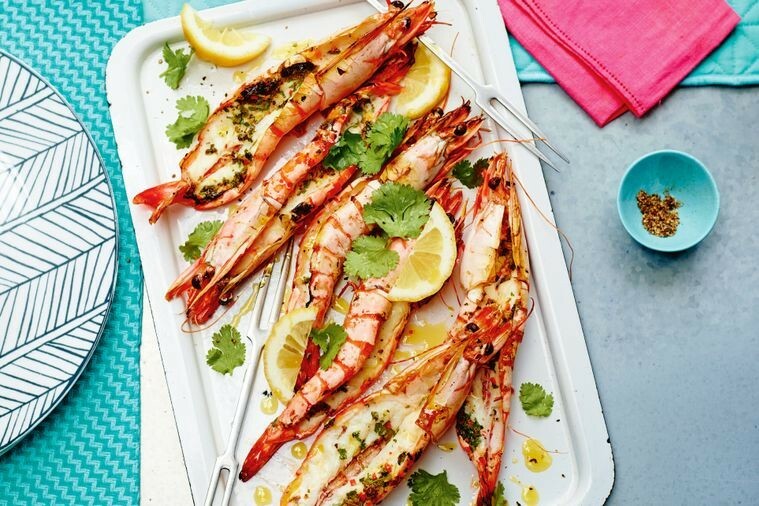 3Prepare a hot griddle pan or braai fire and cook the prawns, meaty side down, until well marked. Turn over and cook on the shell side for 2 minutes. Squeeze lime or lemon juice over and serve with our Sweet Chilli Chutney as a dipping sauce. 4Kebab Sticks are made out of bamboo and are thinner and more fragile than sosatie sticks. Best suited to smaller portions such as prawns and cubes of fish.